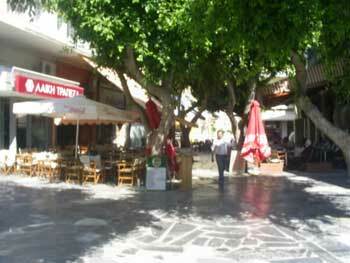 Iraklio (population 160, 000) is the biggest city of Crete and the 5th biggest city of Greece. During Minoan times it was the famous port of Knossos. 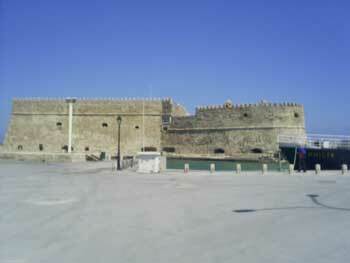 Iraklio is now the capital of Crete. Many tourists find it an ugly city, while others like it. In the centre is a pretty, if small old town. The rest of Iraklio is a sprawling mass of charmless concrete. The town name is written in different ways: Iraklio, Iraklion, Heraklio and Heraklion. The airport, 3km away from the city, is the largest on Crete and can be easily reached from the centre with bus number 1. 80% of all tourists coming to Crete arrive here. There are several flights every day between Britain and Iraklio in the summer, but almost none in the winter. If you want to take a taxi from the airport, there is a big board next to the taxi rank with fares listed for the main destinations of Crete – don’t pay more than that. Buses remain cheap: you can travel for 100km on €8. There are two bus stations in Iraklio, which is rather confusing. Buses along the main Cretan highway (West to Rethymno and Chania, or east to Agios Nikolaos, Sitia and Ierapetra) leave at least hourly. Many other buses go to smaller villages. Knossos, the most famous sight of Crete is 7km from Iraklio, and has buses every 20 minutes. A nice small town with good beaches is Agia Pelagia about 25 kilometers from the capital. Very few buses also go up to the interesting Lasithi Plain. Our article about Heraklion Airport you find on this link. It is the biggest airport on Crete. The best cheap pension in the town center is Rea Hotel. Rooms with and without bathroom, Book here . The owners are very friendly. They have a lot of information about Iraklio and Crete. If full or closed (in winter) Mirabello Hotel is an other good option. 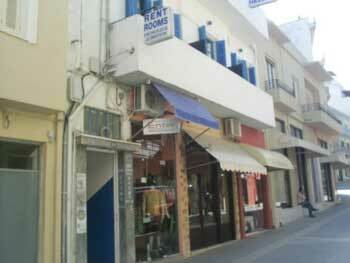 There are two youth hostels, ‘Youth Hostel’ and ‘Rent Room Hellas’. Both are in the centre and quite expensive at €14 a night. Hellas is a bit better than the Youth Hostel, but other hostels in Crete – especially in Plakias and Rethymno – are much better places. If you go out to eat in Iraklio, there are hundreds of places. Go where the locals go, and you won’t be disappointed; give the tourist restaurants a wide berth. Old Port: In Venetian times, the port was very important. There is a big monument, Koules, looking over the harbour. From the port you can walk up a large street called August 25th to the old town. Old Town: The street ends at Plateia Elefteriou Venizilou. 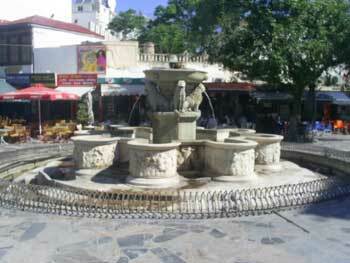 Here you can see the Venetian fountain Morozini (also known as the Lion Fountain), which is the centre of the Cretan capital. In the old town the main sights are the church Agios Titos and the ancient library of Vikelea. Archeological Museum: By far the most important museum on Crete. It contains countless artefacts from the Minoan period, many from nearby Knossos. Unfortunately, the exhibits are poorly described. The museum shop has a guide, which helps a little bit. The museum is open in summer until 7pm, and until 5pm in winter. In summer 2008 the museum was closed for renovations – nobody could tell me when it will open again. Also a great museum is the History Museum Crete, not far from the town centre.